Fortnite community members have been able to generate a number of amazing ideas in the new ‘Fortnite Creative’ mode, and this particular production has generated a lot of attention. As the name of the mode suggests, Fortnite Creative allows players to let their creativity flow by having the ability to design in-game areas from scratch. The addition of ‘The Block’ in Season 7 provides the opportunity for fan-made areas to actually be featured in Fortnite, which has become a goal for various players. Reddit user ‘MelancholicKB‘ brought an interesting spin to the newly-added snow biome by showcasing their ‘Cliffside Cabins’ concept location. 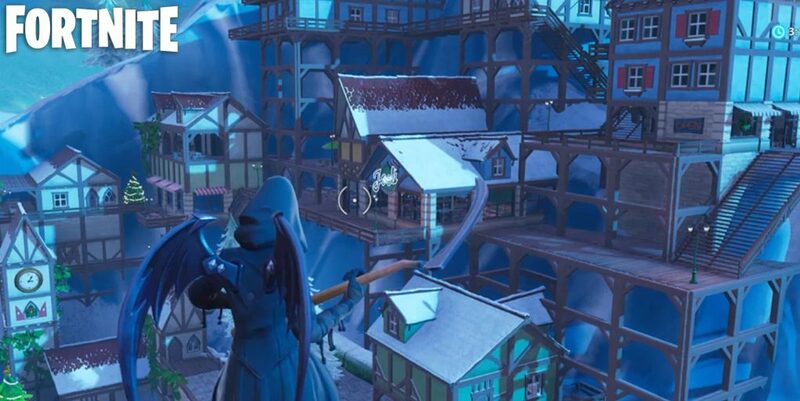 Cliffside Cabins is built directly into the side of one of the massive icebergs around the map, and features various houses, staircases, and a prominent clock tower. An incredible amount of time and effort must have been put into creating such a unique space that cannot truly be found anywhere else on the Fortnite map. While ‘The Block’ is located in an area of the map that does not contain snow, Epic Games could probably find a way to make Cliffside Cabins work in-game if necessary. At the time of writing, it is unclear if Cliffside Cabins will be added to Fortnite, with it remaining a fan-made concept. Would you like to see Cliffside Cabins added to The Block? Let us know in the comment section below.